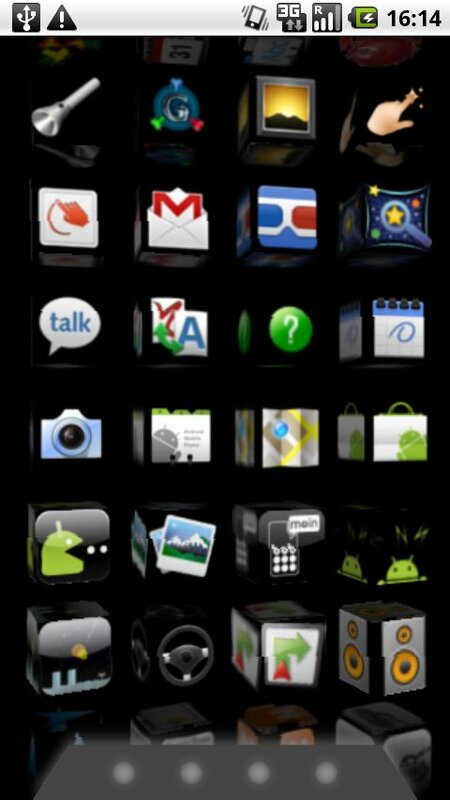 Despite the huge number of homescreen replacements available for Android devices, homescreen 3D managed to catch my attention. Why? Because instead of trying to expand the number of functions of your regular homescreen, homescreen 3D offers a minimalist alternative. Find out about all the details in our test. The basic idea behind homescreen 3D is easy to explain: it closes all your homescreens and leaves you with just the drawer, which is basically the Android main menu. 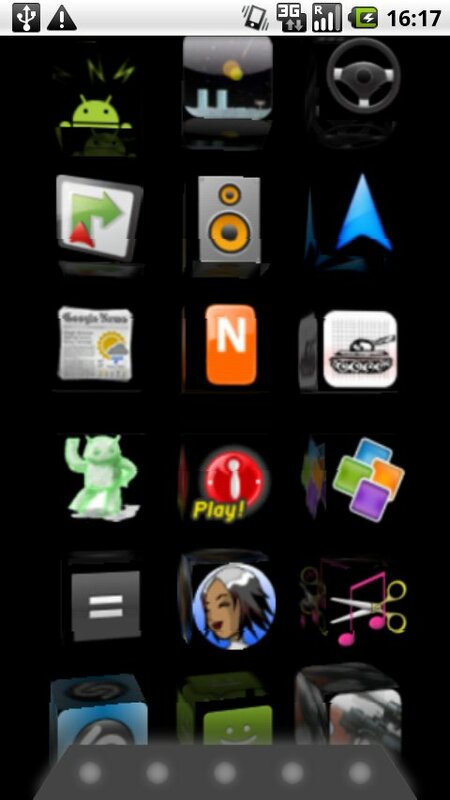 The different icons are then rearranged into three-dimensional animated cubes without displaying the names of the apps. 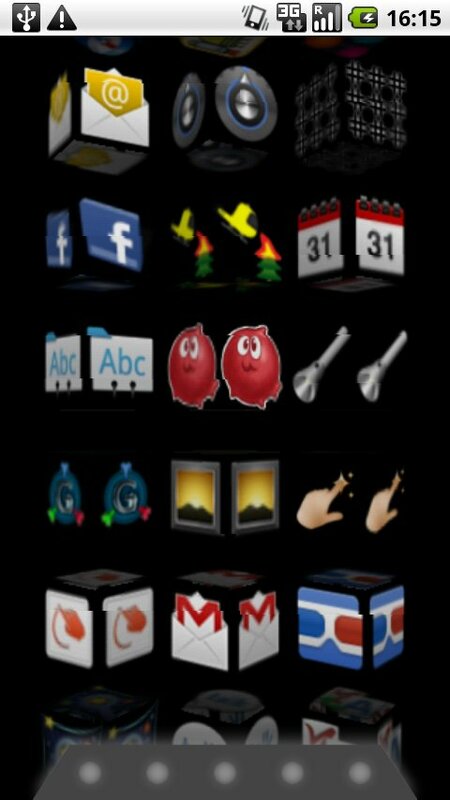 You’re left looking at a scrollable vertical list of animated 3D icons. Your current position in the list is indicated at the bottom of the screen. It’s a question of taste whether you like this type of dramatic simplification. It’s similar to the debate around web browsers. Some people tend to prefer having a lot of features and individuality whereas others would rather use a browser with a slick design. The fact that the app names are blotted out can be a bit confusing for the user, especially with programs that are rarely used. I would recommend homescreen 3D to users that rarely install new apps, otherwise it’s going to be hard to find the necessary app. Although I am personally a big fan of minimalist interfaces, I prefer to see simple designs in combination with a wide array of functions, something I’ve seen offered by other similar programs. This is what makes evaluating homescreen 3D so challenging. On the one hand, the app reduces a lot of clutter and makes the Android main menu more manageable, which is exactly what the app was designed to do. Yet at the same time many crucial functions were simply left out of the app making this app lose most of its potential. Most Android users are, for example, used to having quick access to Settings via the menu button. This saves having to pull up the app menu every single time. Pressing the menu button in homescreen 3D directs you exclusively to homescreen 3D options. This is surely a huge inconvenience for most Android users. texture settings: Icon image quality. It would have been logical to put all these menu options together. The sections “apps list” and “item management” could’ve easily been collapsed into one category and “columns” should be part of “options”. The way the icons are displayed is actually pretty good. In “options” you can adjust the icon rotation, the scrolling perspective, turn page indicator on/off and activate demo mode. In demo mode you can activate a neat little effect that makes your icons move back and forth irregularly. Unfortunately, you cannot click on the icons in this mode so you have to deactivate it immediately. In the end, it’s a totally useless special effect. Another thing that’s missing is horizontal scrolling like you have on a Samsung Galaxy S. On the bright side, you can arrange your icons in any order by long clicking them. You can scroll through your apps faster by pressing the white points in the list indicator. 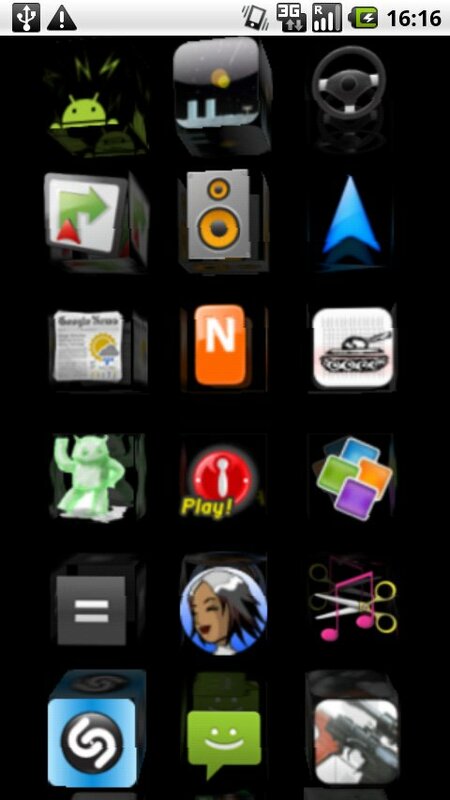 The list of icons looks nice and can be individualized with the help of multiple options. The main menu of homescreen 3D is, unfortunately, very ill-conceived and lack many of features offered by the standard launcher. 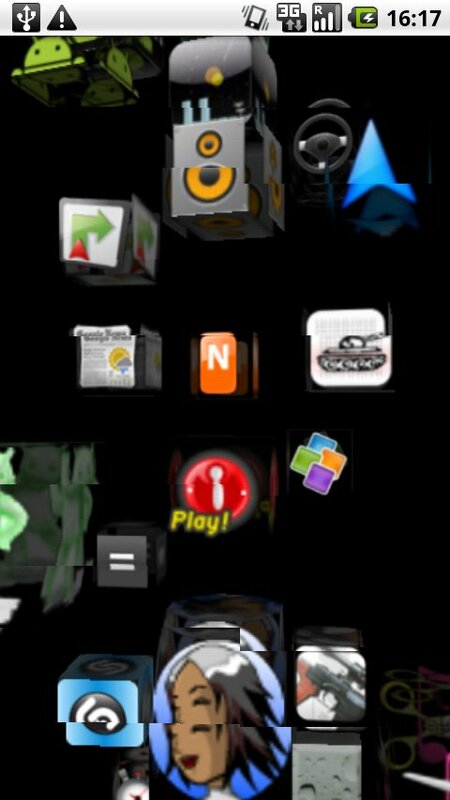 Homescreen 3D runs reliably on my Milestone even with higher texture quality and the scrolling works like a charm. Homescreen 3D (free version) is available for free (no duh!). Every time you open an app, a small window pops up recommending you to buy the full-version. That’s really annoying and needs to be done away with! That's why it was free it doesn't open. what's the problem exactly? you'll need to download the app and then a window should pop up automatically when you press the Home button asking whether you'd like to use your standard interface or homescreen 3D. im sorry but i cant figure out how to use it...?